If you’ve been to one of our introductory Tableau Public trainings and you’re looking for what to do next, you’re in luck! Starting next month, we will hold a more advanced topical training on the first Friday of every month. The goal is to take one topic within Tableau, and in the same 30 minute session, discuss it in more depth than we do in the introductory training. We’ve experimented with a few of these this year, including trainings on formatting, calculated fields and the science of visual analysis. Now, they’ll be a regular webinar alongside our introductory trainings. 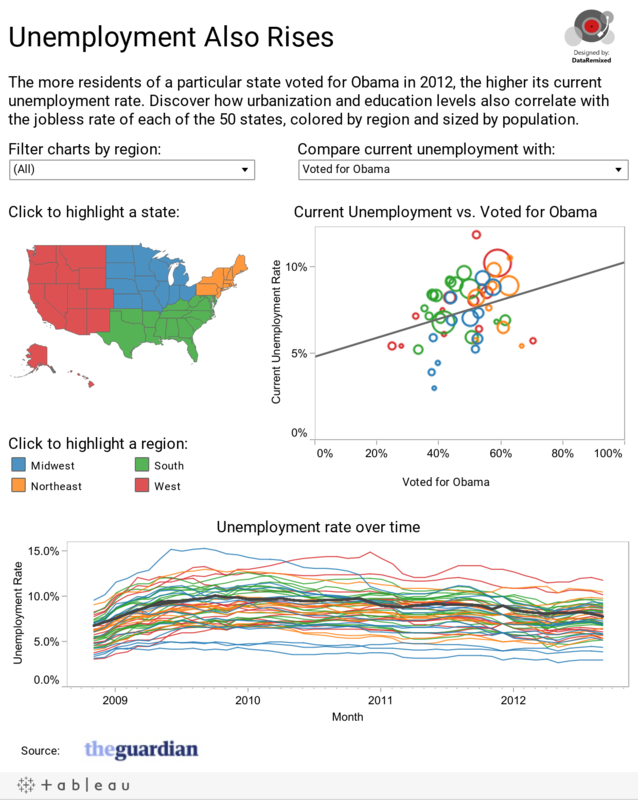 Take a look at Ben Jones’ viz on unemployment correlations (see below) to see a few of these tricks in live form. Beyond January, you can look forward to lots of great topics about Tableau Public, but also about data visualization in general. You’ll also see a repeat of some of our most popular topics, such as our science of visual analysis one.